Sarcoidosis is a poorly understood disease that most commonly affects the lungs but can also involve almost every part of the body including the heart. Cardiac Sarcoidosis (CS) is estimated to be present in 10-25 percent of patients with sarcoidosis. Sarcoidosis is characterized by the presence of granulomas, which are ball-like collections of white blood cells that cluster around and react to a foreign substance. The inflammation associated with granulomas can damage virtually every part of the heart, including the electrical system, muscle, valves, arteries, and surrounding tissue called the pericardium. Sarcoidosis is an inflammatory disease that can affect almost any organ in the body. It causes heightened immunity, which means that a person’s immune system, which normally protects the body from infection and disease, overreacts, resulting in damage to the body’s own tissues. The classic feature of sarcoidosis is the formation of granulomas, microscopic clumps of inflammatory cells that group together (and look like granules, hence the name). When too many of these clumps form in an organ they can interfere with how that organ functions.In people in the United States, sarcoidosis most commonly targets the lungs and lymph nodes, but the disease can and usually does affect others organs, too, including (but not limited to) the skin, eyes, liver, salivary glands, sinuses, kidneys, heart, the muscles and bones, and the brain and nervous system. No one knows exactly what causes sarcoidosis, but it is probably due to a combination of factors. Some research suggests that bacteria, viruses or chemicals might trigger the disease. Although such triggers might not bother most people, it is possible that in someone with the right genetic predisposition they provoke the immune system to develop the inflammation associated with sarcoidosis. The fact that a person is more likely to develop the disease if someone in his or her close family has the disease strongly suggests that genetics plays a role. Researchers have not discovered the genes for sarcoidosis yet, but it seems likely that more than one gene is involved. Once thought rare, sarcoidosis is now known to be common and affects people worldwide. The disease can affect people of any age, race and gender. However, it is most common among adults between the ages of 20 and 40 and in certain ethnic groups. Disease severity can vary by race or ethnicity. In the United States, it is most common in African Americans and people of European “particularly Scandinavian” descent. Among African Americans, the most affected U.S. group, the estimated lifetime risk of developing sarcoidosis might be as high as 2 percent. Most studies suggest a higher disease rate for women. Appearance of the disease outside of the lung is common in certain populations, for example: the eyes (chronic uveitis) in African Americans, painful skin lumps in Northern Europeans and the heart and eyes in Japanese. Sarcoidosis is a multi-system disorder. Symptoms typically depend on which organ the disease affects. Most often the disease will affect the lungs. General: About one third of patients will experience non-specific symptoms of fever, fatigue, weight loss, night sweats and an overall feeling of malaise (or ill health). Lungs: The lungs are affected in more than 90% of patients with sarcoidosis. A cough that does not go away, shortness of breath, particularly with exertion and chest pain occur most frequently with the pulmonary form of the disease. Lymph Nodes: Up to 90% of sarcoidosis patients have enlarged lymph nodes. Most often they are in the neck, but those under the chin, in the arm pits and in the groin can be affected. The spleen, which is part of the lymphatic system, can also be affected. Liver: Although between 50% to 80% of patients with sarcoidosis will have granulomas in their liver, most are without symptoms and do not require treatment. Heart: Researchers estimate that cardiac sarcoidosis, affects more than 10 percent of people with sarcoidosis in the United States, and perhaps as many as 25 percent. Sarcoidosis can cause the heart to beat weakly resulting in shortness of breath and swelling in the legs. It can also cause palpitations (irregular heartbeat). Brain & Nervous System: From 5% to 13% of patients have neurologic disease. Symptoms can include headaches, visual problems, weakness or numbness of an arm or leg and facial palsy. Skin: One in four (25%) of patients will have skin involvement. Painful or red, raised bumps on the legs or arms (called erythema nodosum), discoloration of the nose, cheeks, lips and ears (called lupus pernio) or small brownish and painless skin patches are symptoms of the cutaneous form of the disease. Bones, Joints & Muscles: Joint pain occurs in about one-third of patients. Other symptoms include a mass in the muscle, muscle weakness and arthritis in the joints of the ankles, knees, elbows, wrists, hands and feet. Eyes: Any part of the eye can be affected by sarcoidosis and about 25% of patients have ocular involvement. Common symptoms include: burning, itching, tearing, pain, red eye, sensitivity to light (photophobia), dryness, seeing black spots (called floaters) and blurred vision. Chronic uveitis (inflammation of the membranes or uvea of the eye) can lead to glaucoma, cataracts and blindness. Sinuses, Nasal Muscosa (lining) & Larynx: About 5% of patients will have involvement in the sinuses with symptoms that can include sinusitis, hoarseness or shortness of breath. Other Organs: Rarely, the gastrointestinal tract, reproductive organs, salivary glands and the kidneys are affected. Symptoms of sarcoidosis can mimic those of other diseases. In some cases sarcoidosis may be diagnosed by excluding these other similar diseases. Frequently, sarcoidosis is diagnosed because a routine chest x-ray shows an abnormality. To accurately diagnose the disease, most doctors will take a medical history and perform a physical examination. Laboratory tests of the blood, chest x-rays, breathing tests and biopsy are all diagnostic tools. What is the Treatment for Sarcoidosis? Intense treatment and surgery is required for many patients, especially if organs like the lungs, eyes, heart or central nervous system are affected. There is currently no cure for Sarcoidosis. Treatment is generally done to control symptoms or to improve the function of organs affected by the disease. While some progress has been made in understanding the symptoms and more effectively diagnosing the disease, little is known about who is susceptible to Sarcoidosis and the cause remains unknown. 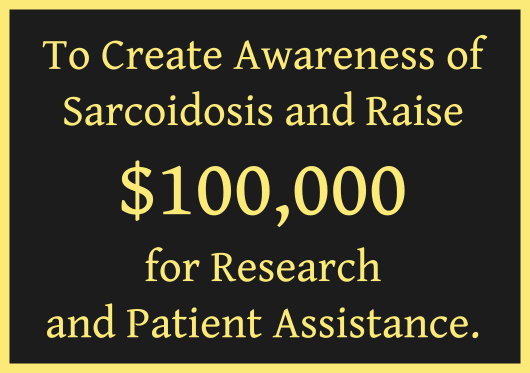 Foundation for Sarcoidosis Research (FSR) needs data to advocate on behalf of Sarcoidosis patients. A patient registry has been created to collect data in an effort to guide researchers to develop new treatments and search for a cure. Without data, we can’t get the funding required to do the front-end research to access NIH grants for advanced studies toward a cure. Thus, no data – no cure. Since Sarcoidosis is still a rare disease, there are little or no research funds coming from NIH grants or big Pharma investments. We can only do this with your help. Your donations will go toward helping with this critical research effort. Thank you for your generous consideration. Click Here to Donate and/or order the book, Getting Better.